Averaged scores are calculated on a 30-point scale based on user reviews. Started Hazel with Perfect Manners because after numerous Pet Smart sessions and another at Narnia Hazel would barely sit and was a nightmare to walk because she was really out of control. If you are debating at all over he cost I would not hesitate for a moment. We got amazing results with Sandy on day 1! After a 1 hour session Hazel was walking like a well behaved dog and on day 2 we had our first normal dinner in almost a year because we sent Hazel to her place and she stayed! Thank you Sandy! Looking forward to lesson 2. We just had our 1st session with Patti and we couldn’t be more appreciative and excited to see what the training brings for Diesel and us. Her style of training not only was calming for him but we were thoroughly engaged as well. Thank you! Thank you! Thank you! Thank you again Sandy for our first training session with Phoebe! We are looking forward to many more sessions with you and especially having Phoebe be a well trained and obedient dog. We are so glad we found you. First experience with a private dog trainer and I couldn’t be happier. I would recommend Perfect Manners Dog Training to everyone. GREAT lessons. There have not been any aggressive acts or lack of compliance with our commands. He seems to be fine with this new status. He actually seems to be looking for praise. He will come up to me, and not jump on me, instead going into a forced sit position. I will then praise him heavily. He periodically jumps when he is excited. This is happening less frequently as the days pass. We have been repeating commands. Thanks for the advice. I will tell Barb. She especially is saying “heel, heel, heel.” when she has a distraction on the walk. Thanks again for the follow up. We are very happy with the results so far, and will call you later in the week. Patty at Perfect Manners Dog Training is wonderful! We have a new golden retriever puppy who surprised us with her aggressiveness and dominant tendencies. We were at wits-end and thought we would not be able to keep her. Patty took August for a weekend of training/boarding and the results were amazing. August came home a compliant, loving puppy…the puppy we had hoped for! Friends and family are amazed by the transformation. Patty has taught us a lot. We are very grateful! Jack is like a new dog! We’ve been following your advice and Jack has become a joy to walk. He actually watches me when we walk now and no more snarling at strangers. We thought Chase would have to be put to sleep. I was amazed that you were able to stop her biting and aggressive behavior. You were our last hope and you literally saved Chase’s life. I admit I was skeptical that anybody could train Butch. He not only failed obedience class but was the most stubborn dog I ever owned. Butch is now obeying commands and walking on a heel without a leash. I’m very pleased. 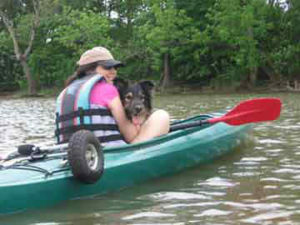 First I want to tell you that we took Dori on the river last week. We were all so relaxed and had a great time. Once we put her life vest on everyone assumed she was in search and rescue training because she was bright orange and incredibly well behaved. After that we ended up at Petco looking for the back pack you suggested we try. It happened to be adopt a dog day so I had to maneuver Dori past a large group of dogs. She did okay. I know we’ll have to work harder at that, but using your methods we got through it pretty well. Someone let their little dog wander up to Dori from behind. There was no time to react so I slacked up on the leash and did some happy talkin.’ Dori was fine with this little dog, who turned out to be a new puppy weighing 4lbs. My biggest concern was that Dori might sit on her! She was startled, but fine. On Mothers Day we went to a local fishing pond with our mom. Dori was delightful. Her focus was taken from time to time by the Geese and the people, but I was able to keep her in check. We went to Hospice in the afternoon and she never left my side unless directed to. She was far less uncomfortable and unsure of herself, falling asleep under the bed of the last person we visited. I introduced her to the tunnel for agility that I bought last year. She didn’t like it, but after 15 minutes of hanging out on the ground with her she followed me in and now she’s running laps through it. I put it away last summer because she just hated it and refused to go through. I forwarded the pictures because I wanted you to see how happy she is. Obviously we are thrilled, but Dori has become relaxed and happy. She’s in my basement studio asleep at my feet. This is not like her and such a pleasure. It was hard to admit I couldn’t ‘control’ my dog, but desperation pushed me to call in a pro. Once Sandy arrived all that changed. He fully understands the nature of dogs and how owners can harness that. My worst moment of feeling like a failure while being honest about the problems we were experiencing was better than the best day I’d ever had with my dog before Sandy came. He doesn’t make you feel bad, but rather capable and informed. He’s a true dog whisperer, focused on helping you enjoy life with your dog the way it was meant to be – Happy, Fun and TOTALLY Stress Free!! Don’t live with it. Don’t put your dog down or give it away. Call Perfect Manners. We have an entirely different dog now. She’s a go anywhere, stay calm, “Oh, wow where can I get a dog like that? !” pooch, and we are loving it! Trust me, you will too. That is all I can say. After a 1 hr session I now have my uncontrollable dog walking at a heel and not going crazy when the doorbell is rung. I am very happy that I had Sandy help with these problems and would HIGHLY RECOMMEND to everyone with a dog. What impressed me is how quickly my dog got the message. It’s like he knew immediately what is expected. It is such a joy to have my dog come the first time I call him. This is money well spent. I think I’ve figured out Sandy’s method. He must have came with a van full of well-trained dogs, and when he took Sparky out for a walk, he spray-painted one to match and switched them out. The walks are such a pleasure now, as opposed to the tug-of-war we’re used to. He’s testing me occasionally, which I expected; but I’m doing my homework and he’s responding beautifully. I know none if this is a surprise to the trainer, but Sparky seems so much happier and he’s calmed down immensely, as I saw even during Sandy’s visit. Thank Perfect Manners so much for this doggy miracle! I will not hesitate to recommend Sandy to anyone I know who can benefit from his service. I just got back from walk with Magic, we went with her dog friend Tucker who is the most well behaved dog I have ever met, well, Now Magic is the most well behaved dog I have ever met. I was able to walk our park for 1 hour and 15 minutes with my friend and her dog. I was even able to drop the leash and she stayed with me until I allowed her to roam while playing when I called her she came without reservation. I even tested her with my neighbor who she loves to see and jump all over. She was amazed as are me and my Husband, Thank you so much…Perfect Manners we should have called them 6 years ago. The walk I took today was the most wonderful walk I have ever had with her. I made her calm down before I let her play with Tucker and she was having a great time and so was I . Thank you again. 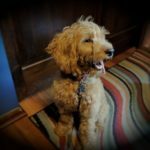 Thank you to Sandy of Perfect Manners-you saved our dog. What a great experience for my entire family! Our dog, Chance was very protective and was lashing out and attacking almost everyone he didn’t know. Sandy taught us what we were doing wrong and what needed to change. Three months later and Chance is a new dog with just one meeting with Perfect Manners. Sandy is like the “Super Nanny” for dogs! I guess I had my dog “repaired”….She was out of control and breaking my heart with her antics. Called Perfect Manners Dog Training and the dog trainer came out and patiently explained everything that was going on in my dog’s little canine brain. The trainer then taught my dog some basic obedience skills and laid out a plan of homework for me. 2 weeks later and she’s like a new and vastly improved dog. I’d recommend them highly! Sandy came to our rescue as I was reaching my wit’s end with my puppy Michael Jackson. He was so excited to see and smell and frolic around, walking him was a chore as all he did was tug, tug, tug and wrap his leash around your legs and become easily distracted. After one session with Sandy, the Dog Whisperer, the puppy was on command, following lead directly, knew to untangle himself and was fully listening to me. The first session we had, he sat down and got a full history of Michael. He learned my biggest issues, observed him and his personality and was able to figure out the big problem preventing us from co-existing without headache. In my case, Michael was assuming he was the ‘pack leader’ and we were having an battle between us for the leader position. He gave me a few hints to assert my dominant position, and after putting them into place, in a short time, we were fine. In teaching my dog the “down” position, which he now does for me with no hesitation, Sandy got bit by Michael, as he wasn’t really feeling it. But he managed the nip, which did not cause any damage to Sandy, the dog complied..and that to me, watching, was captivating. Watching Sandy work with my dog was like watching the dog transform right before my eyes..and I can’t explain how happy it made me. Tears may or may not have formed. What I like most about Sandy, though, is that he gives you the skills to train your dog yourself and he gives you homework to do in between sessions. Now, while he offers a package of 4 one hour sessions for $395, and that includes him coming to your home…he told me that because my dog was catching on so quickly that it wasn’t needed. So, as someone who is budget conscious, while paying $95 for a session might seem like a lot, know that he isn’t out to rob you blind. After two sessions, Michael and I were well on the way to being a happy pair and even now, he’s sitting across from me happily as I type. People should know in advance that he is anti-PetSmart or chain store training sessions, and believes that your dog should obey your commands not because you’re holding a piece of chicken liver in your hand, but because they love you and want to please you. Truthfully, we’re due for a brush up session or two…I will be exploring that in a few weeks, as I want Michael Jackson to learn some more advanced skills. We were completely hesitant to bring in a dog trainer. We thought that was for other people, not us. But, we were at wit’s end with our dog. He was a dog like no other and we really wanted to keep him. That is when a friend referred us to Perfect Manners. I had to wait a couple weeks for a weekend appointment, they book out quickly, but when my day came, Sandy arrived exactly on time. He spent an hour or so with us and our dog. We learned a lot and received a lot of homework so we could work with our dog better and he could live up to our expectations of him. A year later we called Sandy back to help us with some more advanced leash training. The weather was getting better and I really wanted to hit the pavement with my pooch. After one visit, a change of collar and some homework, we no longer have to avoid kids on bikes, other dogs on or off leash because we are quite adept and walking on and off leash. Sandy has been the a great influence on me, my husband and my dog. We are far more exercised than we were, our shoes do not get eaten and the dog plays well with others. I will share with you one little secret. Sandy at Perfect Manners is bi-lingual – that is, he speaks both Human and Dog. And he can translate for both species. Made all the difference in our world! We have a 2 year old yorkie pom and a 9 month old yorkie poo. Their agressive behavior on walks and the excessive barking inside and outside the house was miserable. I couldn’t take them on walks anymore, neighbors were avoiding us (I don’t blame them) and Perfect Manners was our “last ditch effort”. I told the kids if they couldn’t help us we’d have to find new homes for both dogs. Patti came out the day before Thanksgiving and within a half an hour of our 2 hour session, it was like we had two new dogs. They have NEVER behaved so well — my husband and I were shocked at how just a few techniques brought calm and order to our home. Patti was very thorough, answered all our questions and did not judge any of our past mistakes with the dogs. Also, I chose to go with the 4 visit package, and I was not pushed into purchasing it — it was discussed at the very end of our session. The majority of the training was done with our older dog, and I want Patti to come back to help us with the puppy as she gets older. For now, she behaves because the older dog is under control — truly this was a miracle. Thanks, Patti! I have a six-month old Wheaten Terrier who, at four months, became terrified to leave our yard. At first, we tried to coax him with treats and comfort him to try to build his confidence. Nothing worked. Finally, in desperation, I contacted Sandy and Perfect Manners Dog Training. During the initial phone interview, I explained my frustration, and he asked me alot of questions that didn’t seem related to the problem. He visited our home and spent alot of time discussing our situation with my husband and I. Then he took our pup out by himself to “hear his side of the story”. Ten minutes later, I looked out the window and saw Sandy and my formerly terrified dog walking down the street together. He then turned the leash over to my husband and I and incredibly we were able to walk our dog for the first time in two months. He stayed right at our side and since that day, we’ve enjoyed many long walks together. Sandy has a very calm, confident approach, which works wonders building confidence in the dog and owner. I highly recommend him to anyone with behavior issues. He was a pleasure to work with and I would not hesitate to contact him again if other problems develop. Based on the other reviews, I had my first appointment with Sandy of Perfect Manners this week. I don’t give many 5 star ratings but I would give him a 10 if possible. I had hoped that with professional help I’d be able to walk my dog without worrying about being pulled down the icy street and spending time in the emergency room having my broken bones patched. Sandy came out (he was punctual) and asked me a lot of questions that had no apparent relation to simply walking my dog. He wanted to know everything from where the dog slept to whether I gave him treats and for what occasions. After my “interrogation” he said he wanted to hear my pup’s side of the story and he was taking him for a walk. Off they went and within 3 minutes they were back and Sandy told me that they had a fruitful discussion and walking should no longer be a problem. We all went outside and for the first time since I’ve had my dog he walked politely next to me with some coaching from Sandy. I was near tears with joy. Sandy then explained that it wasn’t really a walk but a conversation that we had and my dog should now understand that I wished to assume the leadership position. He next proceeded to have my dog do a sit, a down and then lay down while he tempted him with toys, treats and loud noises. My dog did not move. This time, I really did cry. It was amazing! I’ve always loved my dog but he was a real pain to live with. This all changed in an hour with Sandy. I scheduled additional lessons and can’t wait to advance to more commands. The dog seems happier than I’ve ever seen him and the training not only solved my problem but was entertaining and a lot of fun. WOW to Sandy and Perfect Manners..
Sandy is wonderful and very gentle with my dog Buddy. 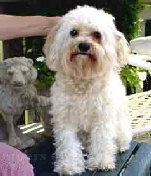 With his guidance, Buddy has changed from an insecure dog who barked at anything and everything into a calm little guy. SANDY, THANK YOU FOR YOUR VISIT TODAY! PACO LEARNED MORE IN ONE HOUR THAN I COULD TEACH HIM IN ONE YEAR! I’VE ALREADY PURCHASED MY NEW LEASH. IT WAS ABUNDANTLY CLEAR THAT THE PET STORE HAD NO IDEA WHAT A TRAINING LEASH WAS. THEY TRIED TO SELL ME ONE THAT EXTENDS AND RETRACTS AND I SAID EMPHATICALLY “NO!” DID FIND A CESAR MILAN ONE AT PETCO, MY THIRD PET STORE! I AM GOING TO REITERATE OUR LESSONS TODAY WITH MY HUSBAND AND MY GIRLS. I HAVE ALREADY DEMONSTRATED TO MY YOUNGEST DAUGHTER HOW PACO CAN SIT! SHE WAS AMAZED THAT HE DID NOT RUN AWAY. THANK YOU!